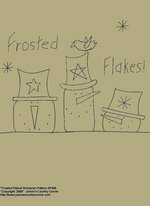 #A518 Primitive Stitchery Pattern "Frosted Flakes Snowmen!" 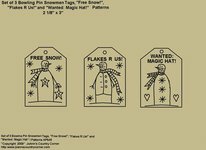 Primitive Stitchery Pattern, "Frosted Flakes Snowmen!" Measures 6" x 7 3/4". 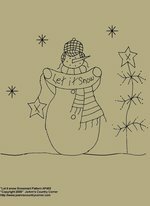 #A520 Primitive Stitchery Pattern, "Snowman, Let it Snow!" 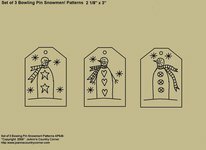 Primitive Stitchery Pattern," Snowman Let it Snow!" measures 7 3/4" x 8". 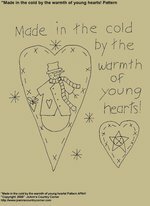 #A534 Primitive Stitchery Pattern, "Made in the cold by the warmth of young hearts!" Pattern measures 6 1/2" x 7 1/2". 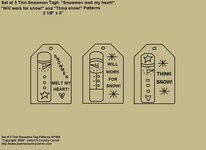 #A538 Primitive Stitchery Pattern, "Set of 3 Thin Snowmen Design Tags with Sayings! Tags measure 2 1/2" x 3". Sayings on tags are, "Snowmen melt my heart! ", "Will work for snow!" and "Think snow!" Please click on pattern to see picture of finished stitched tags! 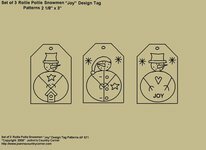 #A542 Primitive Stitchery Pattern, "Set of 3 Bowling Pin Snowmen Tag Patterns!" Tags measure 2 1/8" x 3 ". 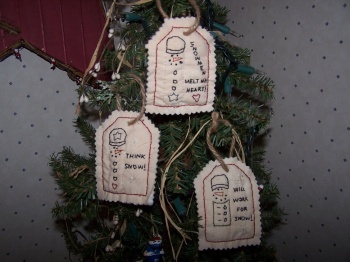 #A543 Primitive Stitchery Pattern, "Set of 3 Bowling Pin Snowmen Tags with Sayings!" Tags measure 2 1/8" x 3". Sayings on tags are "Free snow! ", "Flakes R Us!" and "Wanted magic hat!" Set of 3 Rollie Pollie Snowmen Tags with heart, stars and birdhouse. One snowman has the word "Joy". Tags measure 2 1/8" x 3". Set of 3 Rollie Pollie Snowmen with Stars and Heart Tag Patterns. Tags measure 2 1/8" x 3". 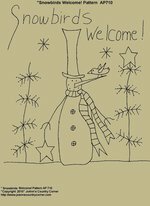 Primitive Stitchery Pattern, "Snowbirds Welcome!" 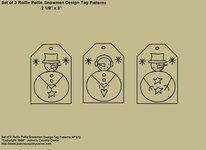 Snowman�Pattern. Measures 7 3/4" x 8". 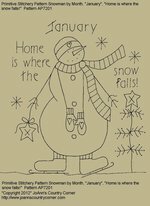 #A630 Primitive Stitchery Pattern,Snowman By Month January, "Home is where the snow falls!" 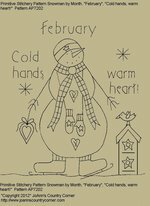 Pattern measures 7 3/4" x 8"
#A631 Primitive Stitchery Pattern, Snowman by Month February " Cold hands, warm heart!" 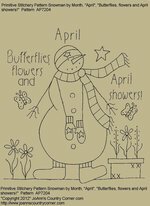 Measures 7 3/4" x 8 1/2"
#A633 Primitive Stitchery Pattern, Snowman by Month April., "Butterflies, flowers and April showers!" 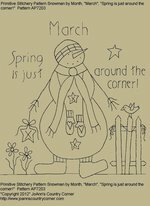 #A632 Primitive Stitchery Pattern, Snowman by Month "Spring is just around the corner!" 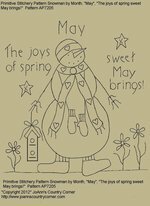 #A634 Primitive Stitchery Pattern, Snowman by Month May, "The joys of spring sweet May brings!" 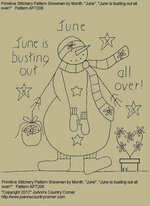 #A635 Primitive Stitchery Pattern Snowman by Month June, "June is busting out all over!" 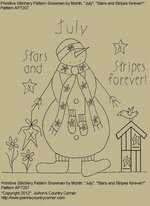 #A636 Primitive Stitchery Pattern Snowman by Month, July "Stars and Stripes forever!" 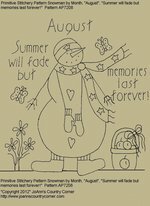 #A637 Primitive Stitchery Pattern Snowman by Month, August "Summer will fade but memories last forever!" 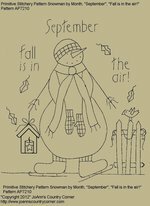 #A638 Primitive Stitchery Pattern Snowman by Month, September "Fall is in the air!" 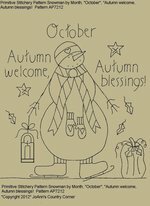 #A639 Primitive Stitchery Pattern Snowman by Month October, "Autumn welcome, Autumn blessings!" 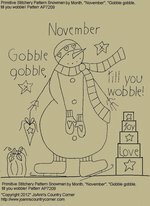 #A640 Primitive Stitchery Pattern Snowman by Month November, "Gobble gobble, till you wobble!"